Blackmur, R.P.. "Emily Dickinson: Notes on Prejudice and Fact (1937)." In Selected Essays, ed. Denis Donoghue. New York: Ecco, 1986. Buckingham, Willis J., ed. Emily Dickinson's Reception in the 1890s: A Documentary History. Pittsburgh, Pa.: University of Pittsburgh Press, 1989. ISBN 0-8229-3604-6. Dickinson, Emily. The Complete Poems of Emily Dickinson. Ed. Thomas H. Johnson. Boston: Little, Brown, and Company, 1960. ISBN 0-316-18413-6 (and others). The Poems of Emily Dickinson. Ed. R.W. Franklin. Cambridge, Mass. : Belknap, 1998. The Manuscript Books of Emily Dickinson. Ed. R.W. Franklin. Cambridge, Mass. : Belknap, 1981. Johnson, Thomas H. Emily Dickinson: An Interpretive Biography. Cambridge, Mass. : Belknap, 1955. Martin, Wendy. 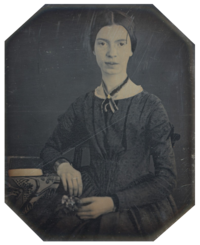 "An American Triptych: Anne Bradstreet, Emily Dickinson, Adrienne Rich". Chapel Hill: U of North Carolina Press, 1984. Sewall, Richard B. The Life of Emily Dickinson. New York: Farrar, Strauss, and Giroux, 1974. ISBN 0-374-51571-9. Emily Dickinson Museum The Homestead and the Evergreens, Amherst, Massachusetts. TV documentary About Emily, about the documentary. LibriVox - Free Audio Recordings of Because I Could Not Stop for Death, I'm Nobody, The Chariot, I Died for Beauty, and others.